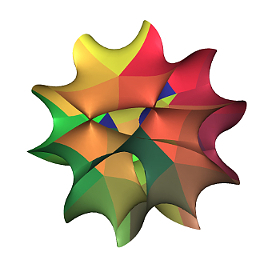 Our collaboration, initially consisting of 10 principal investigators and directed by Robert Bryant of Duke University, will advance the theory and applications of spaces with special holonomy and the geometric structures—calibrated submanifolds and instantons—associated with them, particularly in the two exceptional cases: spaces with holonomy or Spin(7) in 7 or 8 dimensions, respectively. The best-understood special holonomy spaces are the so-called Calabi–Yau spaces; over the past 30 years the study of these from various viewpoints—geometry, analysis, algebra and physics—has been one of the most active and influential parts of mathematics and its applications to physics. The exceptional cases share some important features with Calabi–Yau spaces, but at the same time they remain the most challenging and the least understood, both mathematically and physically. Exceptional holonomy spaces are key ingredients in extracting physics from M-theory and F-theory (generalizing the role that Calabi–Yau 3-folds play in string theory), where they provide models for the extra dimensions of space. Progress in understanding the physical applications depends crucially on a better understanding of spaces, especially singular ones, with exceptional holonomy. Advances in understanding geometric structures associated with exceptional holonomy spaces have often required insights from apparently disparate parts of the field or from outside the field entirely. Our Collaboration therefore brings together the leading mathematics researchers in the various different geometric incarnations of exceptional holonomy with experts on the applications to physics. We will capitalize on several recent mathematical breakthroughs related to the geometric structures associated with exceptional holonomy spaces and also make use of powerful new tools for analyzing singular spaces. Read the announcement by the Simons Foundation.